This is a simple trick from which you can change a cd or dvd into a flash drive. That is , you can cut,copy and paste more than once to and from a cd or dvd after doing the Simple trick which I have explained below! Isn’t it cool to use a dvd or cd like this? It helps you in carrying large data(Of Any size) like movies,Pc games,Apps etc as the flash drive’s memory is not sufficient for that sometimes. And buying a new flash drive is not so economical instead! Also it is nothing else than being stupid if we use a cd/dvd only for the transfering purpose as that will be waste after the job is done. Dont worry I will tell you how to make a Cd or Dvd get this job done. 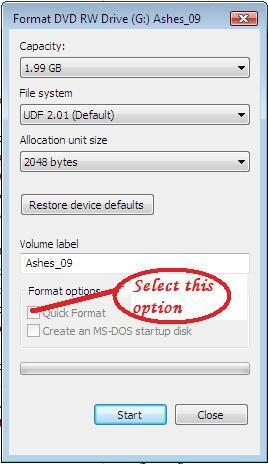 After this a format window will open from which u select quick format option (Mandatory) as in the image below. 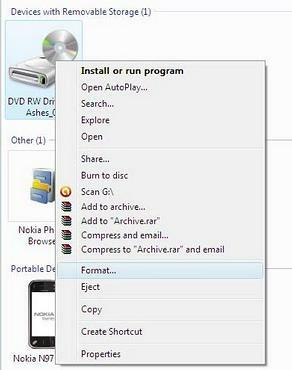 Now by clicking on the Start button, Your new Clone of Flash Drive is obtained from a cd/dvd. Enjoy the trick and save money of buying pen drives…. Note: As far I know this trick works in Win7 and Vista Operating systems. And am not sure whether it works or not in other OSs.